Both classic and fashionably trendy, the tufted headboard lends texture and warmth to your bed’s crown.Whether you choose an elegant cut or one that is squarely masculine, the leather adds upscale elegance not found in most bedrooms. Feminine, with an air of lightness and whimsy, the Ruby headboard take its inspiration from retro-southern influences. From its elegant fleur di lis-adorned base to its sturdy yet modest lines, this delicately-attractive headboard is perfect within any young lady’s private retreat. 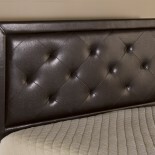 Modern and metropolitan, the Tiburon Headboard appeals to the more contemporary décor. With straight lines and sharp angels, the bed is sophisticated in its simplicity. Reminiscent of the works by mid-century modern designers, this headboard style is striking in form and function. At Mattress for Less, located on the Berlin Turnpike in Newington, we’ve selected an exclusive collection of both Leggett & Platt and Hillsdale headboards to suit your tastes in bedroom decor. Always made of the highest quality materials by industry-leading craftsmen, these headboards are sure to delight in any bedroom. We invite you to visit our showroom and browse this amazing collection for yourself.